Jody Peck [Artist] and Noof Al Refaei [Sikkeh Gallery] contributed with some of the interior featured furniture, while Sara Valente [spoon] andReine Lahoud took lead on the Landscape side. In photos and writing, Noor Noorudin, Quentin de Pimodan, Melchior de Tinguy and Ali Haji are telling the story of Malja, on the blogwww.maljabahrain.com designed by Maroon Frog. It’s finally happening! We are super excited to share with you all this great news about our first brand lunch! 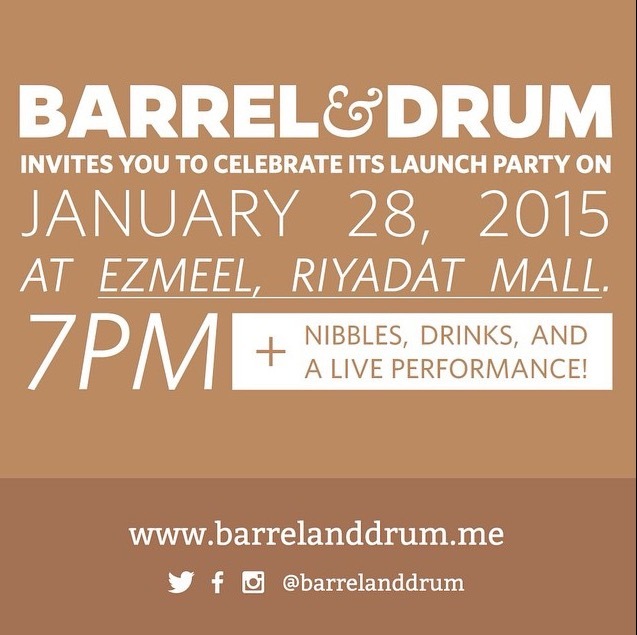 Barrel and drum invites you to celebrate it’s lunch party on the 28th of January 2015 at Ezmeel in Riyadat Mall Bahrain at 7:00 pm! Join us for a night of grub, fun and music by the local band ‘The Relocators’ Don’t miss out!